I’m going to be making and sharing my grandma’s Italian dishes on my blog. 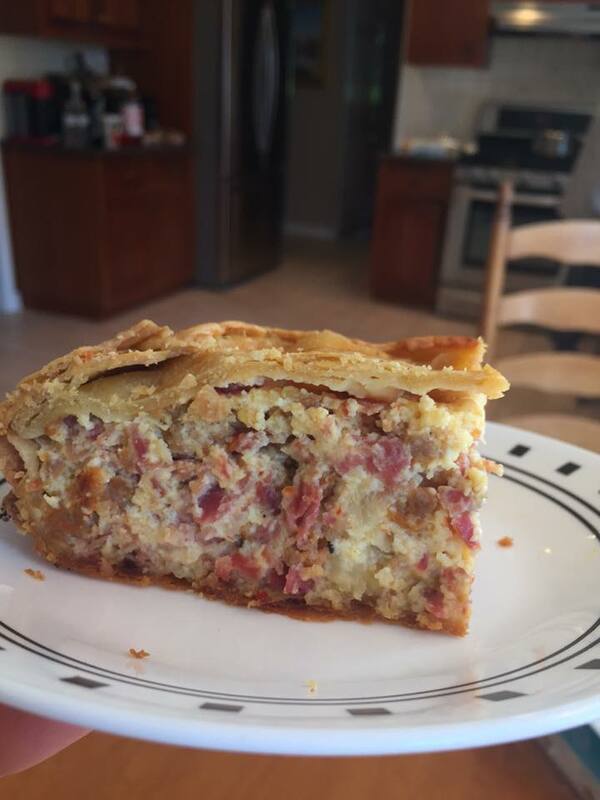 Most recently I made Pizza Rustica for Christmas (though it’s traditionally an Easter pie). I used this recipe for the dish, and will include my slightly modified version below as well. In a measuring cup, mix yeast and warm water. Mix flour, butter, salt, pepper and yeast/water mixture until dough forms and is elastic and smooth. Place dough in a lightly oiled large bowl, cover with a towel and allow it to rise in a warm place for 2 hours, or until doubled in volume. While dough is rising, over medium-high heat, brown the sausage in a frying pan with the water to render the fat. Drain and cool. In a large bowl, combine ricotta, mozzarella, and pepper. Add eggs one at a time, beating with a wooden spoon after each addition. Add cooled sausage, prosciutto, pepperoni, salami, ham, capicola and grated cheeses to ricotta mixture and mix well. When dough has risen, cut into 2 equal pieces (or 4 pieces, if you want to make two smaller pies). Stretch one piece to fit into the bottom and up the sides of a greased pan. Reserve the other piece to make the top. Preheat oven to 375F, and fill the lined pie with the ricotta and diced meat mixture. Stretch second piece of dough and place over the filling, pressing the edges closed. Be careful not to tear the dough. The top edges must be sealed. Make 4 slits in the dough for steam to escape. Combine the egg wash ingredients in a bowl and gently beat to combine. Brush the crust with the egg wash to give it a glossy finish. Bake for an hour and a half until crust is nice and golden brown. Once done, remove pie from oven and let it set before slicing.